Your order will ship TOMORROW if placed in the next 11 hours . Enter your shipping address zip code to receive an instant delivery date estimate from UPS. CCI Blazer 9mm Luger Ammo 124 Grain Full Metal Jacket ammo for sale online at cheap discount prices with free shipping available on bulk 9mm Luger ammunition only at our online store TargetSportsUSA.com. Target Sports USA carries the entire line of CCI Blazer ammunition for sale online with free shipping on bulk ammo including this CCI Blazer 9mm Luger Ammo 124 Grain Full Metal Jacket. CCI Blazer 9mm Luger Ammo 124 Grain Full Metal Jacket ammo review offers the following information; As a top selling brand all over the world, USA made CCI Blazer is the right choice for plinking ammunition! The 9mm Luger ammo is designed to be a perfect starter round, allowing the shooter to have more control over the shot. 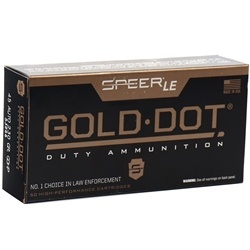 This ammo features a 124 grain full metal jacket bullet. 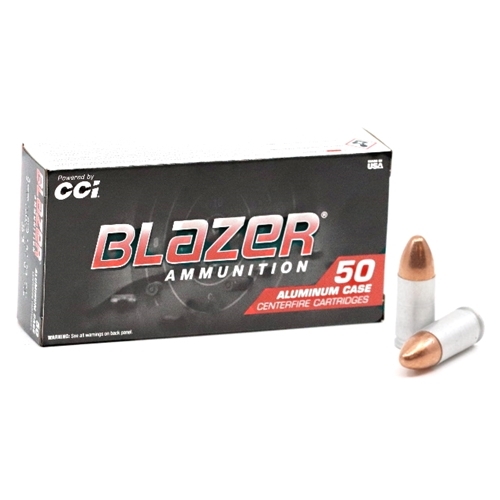 The CCI Blazer 9mm ammo is made with aluminum casings which cannot be reloaded. However, it is priced below any brass cased 9mm ammo and offers shooters an alternative 9mm product that is cheaper, yet reliable and consistent with quality. 9mm Luger from CCI Blazer is a new production, non re-loadable, boxer primer ammunition. CCI Blazer 9mm Luger ammo is packaged 50 rounds per box and 1000 rounds per case. In addition to being one of the most popular calibers in the world, 9mm ammo caliber was just adopted by the FBI. Previously they've used the 40 S&W, but now the switch has been made over to 9mm ammo. Generally speaking, Law Enforcement Agencies such as FBI and others demand the best and only the best, therefore it is safe to say that if you shoot and own a 9mm weapon, you've made the right choice picking out your firearm. Thus, whether you choose to shot CCI Blazer 9mm ammo or something that is more expensive and brass cased, you will find it rewarding and fun. Blazer 9mm Luger ammunition is an excellent choice for plinking ammo. As with any 9mm Luger by CCI, Blazer is clean burning for the best velocity. CCI developed a special coating in order to avoid corrosion on all of their ammunition, including these cases of CCI Blazer 9mm Luger.